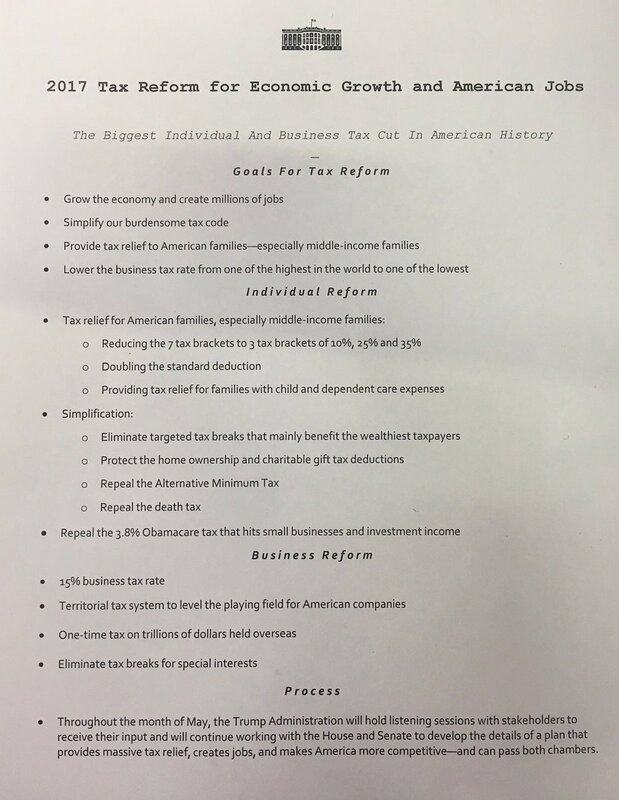 Reading time – 2:55; Viewing time – 5:24 . . .
Amazingly, trickle-down, “voodoo economics,” is once again being shoved up our noses, this time by President Trump with his new tax plan (have a look at the 1-page “plan” here). He tells us that he’ll boldly reduce the top corporate rate from 35% to a miserly 15%. Further, he assures us that there’s no need to end any special interest loopholes. That’s because our economy will have a veritable explosion of growth. And the growth will be such a win – you’ll be sick of winning! – and companies will make so much more money that even at the new reduced tax rate, tax collections by the government will stay as they are. His magical thinking plan will be revenue neutral! Note that that’s what Sam Brownback, governor of Kansas, promised Kansans 5 years ago. Instead, he’s driven his state into recession and borrowed from the state pension system just to stay afloat. The best part of Trump’s plan, he tells us, is that the taxes saved will put so much extra cash into the tills of corporations that they will immediately start a hiring frenzy. JOBS! So many jobs you’ll be sick of jobs and there will be so much joy that CEOs and marketing executives and janitors will skip and sing merrily in the streets, hand in brotherly hand. There’s just one thing: reduced taxes don’t create jobs. Increased demand is what creates jobs and Trump’s plan won’t increase demand. I guess we can forget about the singing and dancing in the streets. In order to get we rubes to go along with his cockamamie plan he’s going to buy us off by slightly reducing and simplifying our personal taxes. Of course, those tax reductions will apply to Trump, too, but with lots more digits to the left of the decimal point for him than for you. In fact, applying his new scheme to the one Trump tax return we’ve seen would put over $30 MILLION into Trump’s pocket in that one year alone. It’s a zombie tax plan, according to Forbes. Trump figures you won’t notice his self-aggrandizement because he thinks you’re dumb enough to be happy with a couple more bucks in your jeans. George W. Bush pulled that same “buying your support” crap by sending you just a few hundred bucks as he put billions into the pockets of billionaires with his first tax cut. He, too, told us the government revenue shortfall would be made up through economic expansion and the extra taxes that growth would generate. How’d that work out for us? Mmmm . . . not so well. Bush even had the gall to pull that tax reduction trick a second time, even though we were at war and we were spending money like a drunken politician. He’s the first president in our history to take us to war and reduce taxes at the same time, instead of raising taxes to cover the cost of his war. We’ll be paying for his fiscal stupidity for a hundred years. Trump wants to cut taxes, build national infrastructure, build the damn wall, cut taxes (yes, I know I already said that), rattle sabres at North Korea, fire $30 million worth of missiles at Syria, do who knows what with his bromance buddy Putin, eliminate regulations and, of course, cut taxes. And it’s all being planned by his Goldman Sachs buddies. What could possibly go wrong for middle class and poor Americans? Ronald Reagan started this trickle-down idiocy in our government nearly 4 decades ago and it has never worked. Let me repeat: It has never worked. Benefits from lower taxes never trickled down. If you were poor, you became poorer. If you were middle class, you stagnated. All that money poured instead into the pockets of CEOs and shareholders who stuffed that cash into their investment portfolios. All the job growth we experienced over the years can be attributed to other factors, like the technology boom of the 1990s and the stimulus program of 2009, neither of which was a trickle down gimmick. I told you in that earlier post that one of my intolerables is lying, like Paul Ryan telling us that his plans for Social Security and Medicare won’t privatize those programs – except that’s exactly what his plans would do. Trump is now telling the same lie to us that Reagan and the rest of the free market radicals have lied to us about since 1980. Is that intolerable? We have to know, or we’ll fall for it again. Are we that dumb? Both Mark Twain and Benjamin Disraeli liked to say, “There are three kinds of lies: lies, damned lies, and statistics.” How would you categorize trickle-down economics? How would you categorize nearly anything Donald Trump says? Big doings in Elgin, IL next Sunday. 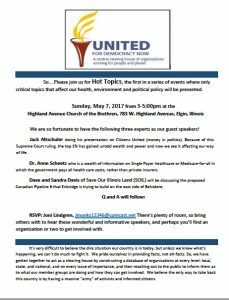 Come join us as our presenters give us the inside skinny on healthcare, the Canadian pipeline planned to go through Illinois and Money, Politics and Democracy: You Aren’t Getting What You Want. The sessions are free, open to the public and offer you an opportunity to learn without any of the all-too-common Washington spin. Join us. Reading time – 4:13; Viewing time – 6:26 . . . There was a lot of talk about President Obama’s “red line” regarding Syria’s use of chemical weapons against its own civilians in 2013. Obama was and continues to be scorched by conservatives for having taken no action. What is so conveniently forgotten is that at the time there was a great deal of complaining about an “imperial presidency,” about presidents taking the country to war without the required consent of Congress. So, Obama went to Congress and asked for an official authorization for the use of force in Syria. Big surprise: the Republican majority Congress refused to even bring it up for a vote. Now, President Trump is faced with his first foreign crisis, created by President Bashar al-Assad of Syria having yet again attacked his own citizens with sarin gas. Strangely, Trump has done a turnaround from his repeated warnings to Obama in 2013 to avoid any entanglement with Syria. Trump’s cautions followed Assad having just attacked his people with sarin gas. We saw the horrific pictures then and Trump was adamant that Obama not take action. Now, Trump is all about taking action, although nothing substantive has changed on the ground since 2013. President Trump, the “don’t touch Syria” guy, launched 59 Tomahawk missiles into the al Shayrat Airfield near Homs, Syria on April 6. The attack was only symbolic, in that it won’t significantly change Assad’s military advantage or the Syrian civil war. The fundamental of decision making is to start by declaring a vision of a better tomorrow – the “why” you do what you do. Once that is articulated, the next step is to identify what you will do to create that vision – that’s the strategy, the “what” stuff. 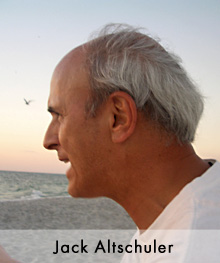 Last is to decide on the tactics – the “how” you will do the “what” stuff. Somebody please tell me what Trump’s vision is. No, not the marketing slogans he spouts endlessly, but the vision. What is the better tomorrow he wants to create? Okay, that’s too hard, so let’s go to the strategies. What are Trump’s strategies? C’mon, name just one. Okay, that’s too hard, too, so let’s name a tactic. Oh, right, he launched Tomahawk missiles in reaction to Assad’s reprehensible behavior, with Trump claiming he was deeply changed by what he saw, which as noted, was essentially, exactly what he saw in 2013 when he wasn’t deeply moved by what he saw and he advised President Obama not to interfere in Syria. Those Tomahawk missiles were launched in direct conflict with Trump’s own policy view and that of his chief strategist, Steve Bannon. “It’s America First,” they tell us, so what does a foreign civil war in the Middle East have to do with us and why should we get involved? Also, what strategy does the tactic of firing missiles serve? Betcha you can’t name one. Try this: Trump has had failure after failure since he assumed office. He has been found to be woefully lacking as a leader and his approval rating has been in free fall. Now, instead of leading, he has become merely reactionary to external events and has fired off missiles at a Syrian airfield, an act which will change not very much in that civil war and which leads to nothing because it’s connected to nothing. Nevertheless, he will claim that the Tomahawk missile attack is proof that he is a strong leader. Listen for that at a Sean Spicer press briefing soon – maybe already. Future events may show that attacking the al Shayrat Airfield was the right thing to do to prevent further attacks on Syrians by chemical weapons, barrel bombs and other munitions. It may become clear that this attack was necessary to protect American troops in the area and to prevent transfer of chemical weapons to third parties who might use them in the U.S. The world might prove to be overwhelmingly in favor of taking action against the atrocities Assad creates. However, it is sadly most likely that Trump’s decision to deploy our weapons was actually done to help Donald Trump rally domestic support for himself and to prop up his miserable approval rating. As the Syrian people continue to suffer, they are still banned by this president from coming to this country for refuge from that awful war, even as Trump has puffed himself up on Tomahawk missiles. Senator Tom Cotton (R-AR) made quite a name for himself in 2015 by trying to scuttle the Iran nuclear deal our diplomats were working hard to create. He wrote a letter (download a PDF of it here) and got 46 of his Republican senator pals to sign it and sent it off to the leaders of Iran. The letter essentially gave a lesson about our Constitution to the Iranians, with the clear implication that they should not trust those in the American administration with whom they were negotiating. Our national history is that partisan disputes have always stopped at the water’s edge. Only the president negotiates with foreign powers and we stand united relative to the rest of the world. 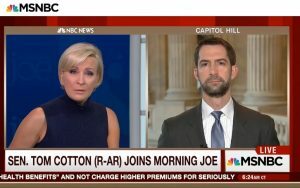 Undermining the President as Cotton did could easily be described as treason. 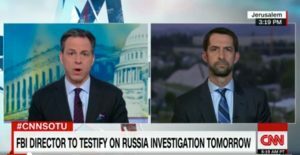 That’s why it’s so odd to see Cotton being interviewed so frequently on cable news shows now, as though he is an honest broker. Someone please tell me why any American should listen to him. Finally, Senate Majority Leader Mitch McConnell claimed throughout 2016 that he wouldn’t give a hearing to President Obama’s Supreme Court nominee because presidents never nominate to the Court in their last year in office. Of course, McConnell was right – except for Woodrow Wilson, Franklin Roosevelt, Dwight Eisenhower and more (read more about it here). Now McConnell has used the so-called nuclear option to break a filibuster and the Senate permanently so he could jam his preferred candidate onto the Court. And some wonder why the public’s trust in government is around 19%. Reading time – 3:51 seconds; Viewing time – 5:57 . . . The press is under attack, and rightly so, according to Donald Trump. He has let us know in no uncertain terms and repeatedly that those in “the media” are dishonest – so dishonest – they lie. I’m guessing that “he’s been hearing” that most are devil worshipers with unpatriotic foreign stuff in their attics. I’m sure he’s hearing that “people are saying” they may not be real Americans. Some might be black. Or Muslim. Or both black and Muslim. Bad. Sad. President Lying-78%-of-the-Time has a penchant for falsehood. Trump’s integrity outages may have been of relatively small consequence during the campaign (except, of course, to rally attendees who got beaten up at his direction), but his dishonesty has huge consequences on the national and international stage now that he’s the president. You need to read the Los Angeles Times 4-part editorial series The Problem With Trump. These essays provide a level-headed and shocking analysis of what’s really going on – it’s big and everything we hold dear is at risk. Trump’s dishonesty is happening during an era of vitriolic, polarized politics, especially in Congress, which makes constraining the worst of Trump’s lunacies next to impossible. In large measure, that is what puts everything at risk. I’ve written several times about looming fascism in America (click on Fascism in the Categories list to the right) because of the bully in the White House and the extremists in Congress. I have seen nothing to mollify my concerns. While I don’t know if Trump is even capable of planning such a thing, I’m confident that Steve Bannon and Jared Kushner are capable of that and their influence only grows. And, no, don’t imagine for an instant that because Kushner is Jewish that he’s not capable of driving our nation to fascism. Not Nazism; fascism. Read the Los Angeles Times pieces – all 4 editorials. Now let’s connect this to a broader reality. Republicans united behind a serial swindler and self-confessed sexual predator – what happened to their spine? So, chicken or egg first? It really doesn’t matter if nothing is solidly reliable. Recall your 8th grade science class, where you learned about Sir Isaac Newton and his Laws of Motions, the first of which (paraphrased) was, “A body in motion tends to stay in motion unless acted upon by an outside force.” Your teacher may have demonstrated that law with a thrown ball, which would have carried out to the most distant reaches of the universe, but for that pesky gravity thing, the immediate outside force. Gravity changed the trajectory of the ball and made it accelerate in an arc toward the center of the Earth. 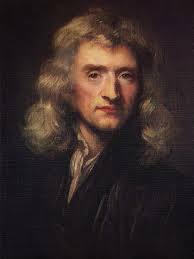 Yes, I know that’s more science than you were looking for in a political commentary, but perhaps you remember some of that – surely you remember that Law of Motion, and that’s the main point. Unaffected by an outside force, everything keeps going on its trajectory, and that’s true of politics, as well. So, if there is a different future that you want to see than the one we’re headed toward, there better be some force acting upon it. Get off the couch and get on the streets. Protest. Resist. Recruit. Call, text and write to your congressperson and senators. Show up at their doors. Join with others at MoveToAmend.org, CommonCause.org, Represent.US, Mayday.US and kick in a few bucks to save your democracy. GET A POLITICAL BULLHORN AND MAKE YOUR VOICE HEARD! *Epistemology – The theory of knowledge, especially with regard to its methods, validity and scope. Epistemology is the investigation of what distinguishes justified belief from opinion. Reading time – 2:44; Viewing time – 3:46 . . . In anticipation of Chancellor Angela Merkel’s visit to the U.S. and her discussions with President Donald Trump I was struck with a BFOTO (blinding flash of the obvious), that Merkel is in a unique position – that’s “unique” as in: she’s the only one who can do it – and I started to daydream. The dream began with the clarity that Merkel presides over the strongest economy within a 2000 mile radius – maybe further. She grew up in Soviet communist East Germany, so she has no false illusions about life in a totalitarian regime. And her having come of age in post-WW II Germany means that Merkel has a solid understanding of the horrible consequences of a country electing a charismatic, sociopathic leader. She knows what happens when the people don’t stand up to a tyrant. So, I dreamed that all of that and more put Merkel in the unique position to stand up to Trump, to refuse to put up with his vacuous diatribes. I dreamed that she ignored Trump’s fatuous claims and scoffed at his baseless bragging. I dreamed that she talked with him on an equal footing about NATO and pushed back on his blinders-in-place foreign policy nonsense and told him to listen to his generals, who tell him to expand, not contract our diplomatic corps, instead of expecting that we can bomb the world into Trump’s cartoon vision of trade arrangements that work for him. My daydream was about Angela Merkel telling Donald Trump where the bus stops. It was about Merkel speaking to the world, imploring us to stop this self-important manipulator before it’s too late. She’s the only world leader who can do that. 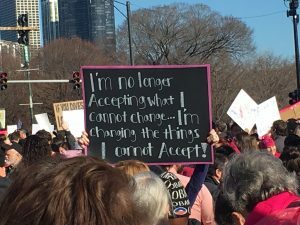 Then my daydream ended and I realized once again that we the people are standing up to this tyrant and will continue to stand up and tell Donald Trump where the bus stops. Trump and Speaker of the House Paul Ryan have promised unspecified additional legislation at a later date to fix this hollowed out program, which is lovely if you like pie in the sky. Now they say they’re open to adjustments and amendments, this in hopes of being able to squeak the bill through the House. But the bill will send hundreds of billions of dollars to already wealthy people at the cost of cutting over 50 million Americans out of health insurance altogether and it will impoverish millions more. Some of us want to help our mostly wealthy legislators to feel what that’s like. We want them to walk in the shoes of, say, a 60-year-old making $25,000 per year whose health insurance cost will balloon to devour over half of their income. Here’s how you can help these disconnected legislators feel the pain. Sign the Change.org petition calling for removing healthcare subsidies for members of Congress and their families. See how they like that. There are nearly 600,000 signatures on this petition already and it’s heading for a million, so be sure to post the link to the petition on your FaceBook page. Reading time – 5:55 . . .
David Norman is a truly gifted executive coach and a good friend. He is also an erudite cynic, although he doesn’t use the word “erudite” to describe himself. Of course, that’s misplaced humility, because he’s an informed and insightful guy. And as you’ll see, he does use the word “cynic” to describe himself and does so quite deliberately. First, and as a backdrop, I see myself as a cynic, at least in George Bernard Shaw’s estimation: “The power of accurate observation is called cynicism by those who don’t have it” (The World). It is from this perspective that I opine. This was quite prescient, especially considering it was written some 96 years ago. In this 1985 book, Amusing Ourselves to Death, Neil Postman critically examines TV and how, in his basic thesis, it has negatively affected the level of public discourse. In the foreword, Postman examines two dystopian visions, Orwell, in 1984, and Huxley, in Brave New World, who depicted a population too amused by distractions to realize that they had been made powerless. In Chapter 9, “Reach Out and Elect Someone,” Postman examines how political elections have simply become a battle of advertisements, in which candidates develop images meant to work in the same way that commercials do, by offering an abstract image of what the public feels it lacks. “As a result, people no longer vote what is best for them, but rather vote what they are told they lack in their lives” [emphasis added]. Postman ends his work with “The Huxleyan Warning,” in which he returns to the basic premise that Aldous Huxley was right; i.e., that we are too amused by distractions to realize we have been made powerless (excerpts from here). Amusing Ourselves to Death was published 32 years ago. Ronald Reagan, in 1987, eliminated the FCC’s Fairness Doctrine that required the holders of broadcast licenses both to present controversial issues of public importance and to do so in a manner that was honest, equitable and balanced. The doctrine did not require equal time for opposing views but required that contrasting viewpoints be presented. It is not a coincidence that Fox News was started nine years later by Roger Ailes, ex-media consultant for Reagan, Nixon, and others. The U.S. Population, as a whole, has become desensitized and avoids asking piercing, thought-provoking questions, choosing instead to be led (by the nose ring, as it were) by a TV “talking head” of their preference, one or more who support our limited world view (yet, interestingly enough, we don’t even realize that “our world view” is limited!). We listen, we accept and believe. As a population, we can’t parse actual reality from “reality TV.” Not only do we not turn against TV, we actually become further hijacked by “technologies” (as Postman describes TV, even before social media, et.al.) and worship the words. Facts or alternative facts; it really doesn’t matter. “It” was said on TV; therefore, it is perceived as the truth. So, What Does This All Mean Now? We should not have been surprised by the election results, but we (read that as, my wife and I) were shocked. My contention and belief is simple: as a population we are not doing any critical thinking. Note that The Texas GOP, in their 2012 platform, “opposed the teaching of Higher Order Thinking (HOTS) . . .” We wouldn’t want our citizenry asking critical questions, would we? Yet people are not incapable of learning; many simply refuse to be informed – a willing and perhaps gleeful ignorance, if you will. I do believe, as does Postman, that we have dumbed-down American citizenry to a point that “they” (the ubiquitous, “they”) sit slack jawed, empty-minded in front of the TV believing that (1) Survivor is real, and, (2) listening to those “talking heads” who support their limited view of the world, thereby simply amplifying the noise and static in their heads and anger in their gut. If, however, you are willing to learn and be informed, and have critical thinking skills (and, apparently, not associated with the Texas GOP), then you could not have mentally transposed Trump’s pre-election rhetoric and proven, egregious behavior into a possibility of him being successful as president. In the run-up to the election I simply dismissed his election as a non-plausible circumstance – it simply couldn’t happen in the U.S., I said multiple times out loud, “Don’t worry, I have more faith in our population.” Yikes! Yet, the signs were in front of me/us all the time, and was I ever fooled. In summary, and to paraphrase Postman, we have dumbed-down ourselves to death, and have doomed ourselves to have an Orange-Marmoset-On-Head-In-Chief (OMOHIC), armed with Twitter as a megaphone, encouraged by White Supremacists (Bannon and Miller) as earwigs and backed up by three generals as Next-Line-in-Charge. This is the fire under the boiling cauldron of today’s politics. Throw into this cauldron an evil witches brew of a public that is increasingly vengeful, fragmented, scared, voiceless and hateful (as not only encouraged by, but also condoned by our OMOHIC). Flavor the mixture with a heavy dose of legislative and, to a certain degree, judiciary dysfunction. What possibly could go wrong? How could this cauldron of acidic, epic ingredients not boil over into national and/or international conflict? What’s your answer that question? Tighten your seat belt; this will be quite a ride! What government do we in America deserve? 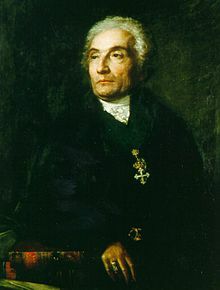 Have we done the work of citizenship that is required for a representative democracy to function well for the people? As you’ve seen, our guest essayist suggests we have not. Roger Cohen agrees. I entitled this offering What Ails Us because it is insufficient to swat at the symptoms of our dysfunction; we must deal with what is causing our national ailing. Don’t imagine for even a moment that Donald Trump is what ails us. He is a symptom, an unavoidable outcome of what we Americans together have put in motion. Figuring this out and repairing it will require critical thinking from everyone, including citizens of Texas, and especially including you. Share your best thinking below. Reading time – 1:22; Viewing time – 2:30 . . . When one of us is victimized, we are all victimized. Is it alright that some of us are being diminished? We better figure out really fast that everyone is somewhere on the list of those who will be diminished sooner or later unless something powerful happens. You must take action. You must get up and speak out. Black lives matter. Brown lives matter. White lives matter. All lives matter. And we all better be demanding that. Otherwise, nobody’s life matters. There are people who would take from you whatever you hold dear. The only way to stop that is to stand up for what you believe in. Are you dispirited? That’s not enough. Are you sad? That’s not enough. Are you enraged? That’s not enough. Sometimes the threats we face are right in our faces and they are easy to see and easy to fight. Sometimes they’re hard to see, like global warming, but they’re here just the same. And they will harm you and the people you love unless you do something to stop them. Do you care? That’s not enough. Do you worry? That’s not enough. You must demand the world you hope to see. You must protest what you know is wrong. Are you smart and clever? That’s not enough. Do you want better? That’s not enough. It’s hard work. It is full of disappointment and frustration. But you already know that nothing that is worthy of you is easy to achieve. Your children and grandchildren are counting on you. So take action. Get up and speak out because that is worthy of you. What If There’s a Reason? Reading time – 1:54; Viewing time – 3:12 . . . Candidate Trump carried on an unrelenting war on the “dishonest press.” He declared that they are all liars, that they can’t be trusted. 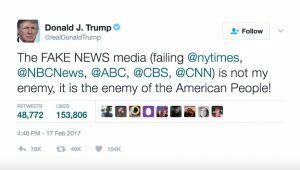 Now, as president, he has made the stunning pronouncement that the press is the enemy of the American people. Note that’s the same message V.I. Lenin delivered in establishing communism in Russia. All of Trump’s claims are true, he admonishes, except, of course, for those few who report favorably about him. Clearly, there are some in the press who have an agenda other than simply reporting the news and calling out that behavior has some merit. On the other hand, that describes only a very small percentage of reporters (can you name even one?) and certainly doesn’t describe those from major outlets, like The New York Times, CNN, The Washington Post, and The Wall Street Journal. Still, Trump has pummeled those and others with a continuous blistering attack of vague, vitriolic accusations. But what if there is more to this than Trump’s mental pathology? What if there are practical explanations for his fusillades? Let’s see if we can conjure what those might be. I have two to offer. First, this is a time of populist anger at anything that might fall into the category of “establishment,” so attacking such things as the mainstream press both gives voice to the anger of the people and establishes Trump as one of the people. Really, how else would a farmer in Nebraska be able to identify with a gold-plated elitist from New York? That’s a powerful ploy, powerful enough to get him elected. Second, and this is the truly pernicious one, imagine what is to come. There already has been a great deal of reporting on Trump’s business activities and the specter of conflict of interest and perhaps outright law breaking is more than a shadow on the horizon. To expect further revelations from determined investigative journalists is realistic and Trump won’t like that reporting. His only defenses will be to lie about it and to attack the reporters. If journalists are held in low enough esteem by then (and the national approval rating of the press is currently about the same as that of Congress), he may be able to get the people to ignore or even oppose adverse accusations about him. He may be able to yet again portray himself as an innocent victim of a dishonest press. Without that Fourth Estate to protect us, he may be able to spark a populist uprising against Congress itself. Who knows what will happen from that? What’s your notion of why Trump maintains the drumbeat of attack on the press? Enter it in the Comments section below so we can think about this together. As a corollary to this question, you must read Bret Stephens’ comments delivered at the Daniel Pearl Memorial Lecture at the University of California, Los Angeles (here in print and here in video, which includes additional discussion). In this age of “alternative facts” and the mind numbing acceptance of what should be found abhorrent, Stephens will restore your belief in integrity and make you believe that it still lives.